A whole pile of new stuff went into our little WAC space today, and lots of it is very kitsch indeed!! Here are a few of my top picks. Ding ding!! 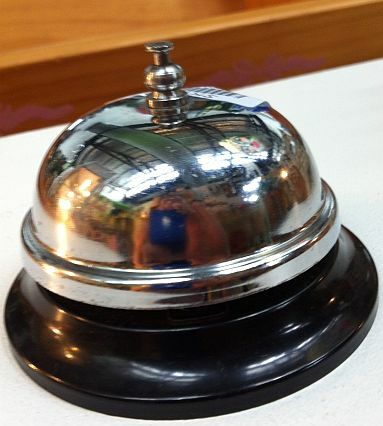 Call your minions to order with this bakelite & chrome shop counter bell. Hands up if you remember these! What a cutie, little girls musical jewellery box with (working) twirling ballerina. 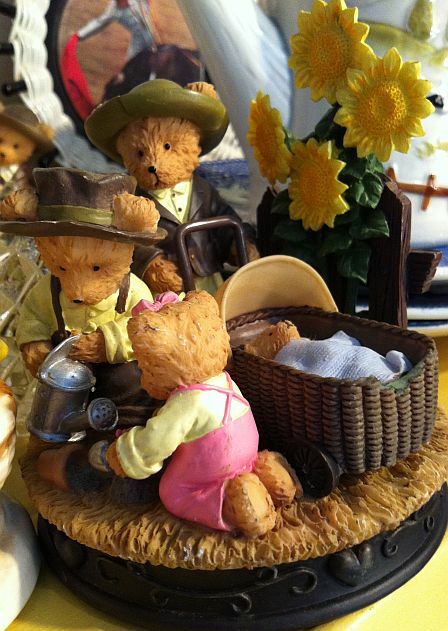 Another one many of you will remember, Holly Hobbie trinket box. 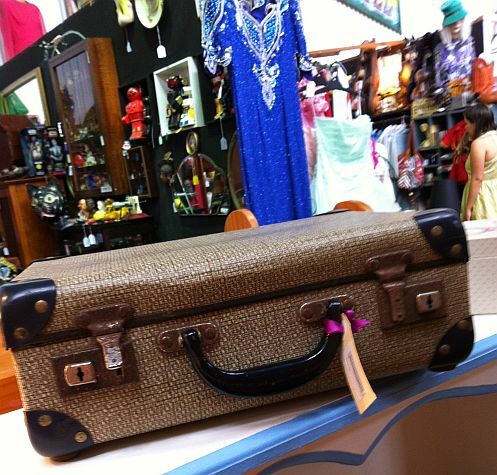 Mini suitcase with navy metal handle and trim, holds A4 paper perfectly, wouldn't this look fab next to a vintage typewriter on a retro desk setup. 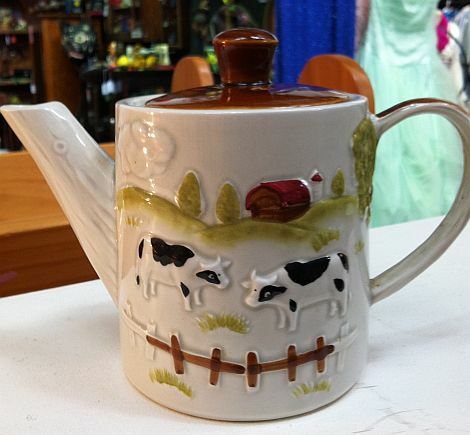 Japanese Gempo ware cow teapot, why is it all about cows and animals this week? Don't ask me! 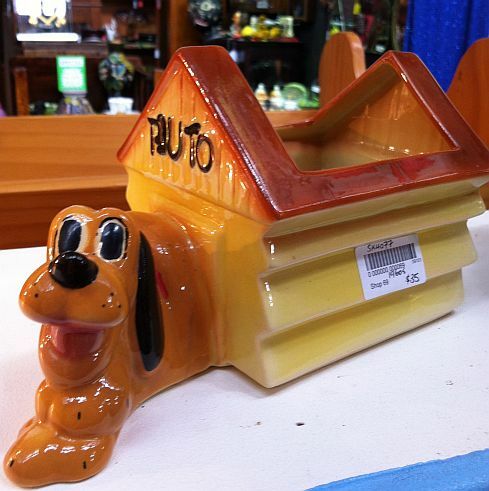 Uber kitsch Pluto pup planter, in the 50s style but not so old as that. 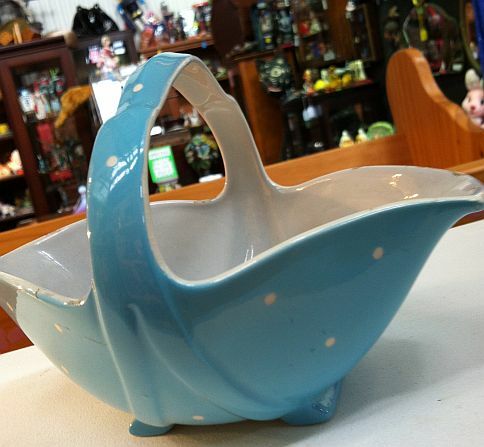 Royal Winton polka dot ceramic basket, a little rough but oh-so-cute for a 50s lover. And should any of you be into teddy bears, we have a whole series of these resin ornaments, all are hand painted with the most incredible detail. Hey, Kitty, forget that jewelry box, I'm loving the aqua dress behind it. All very cute pieces. 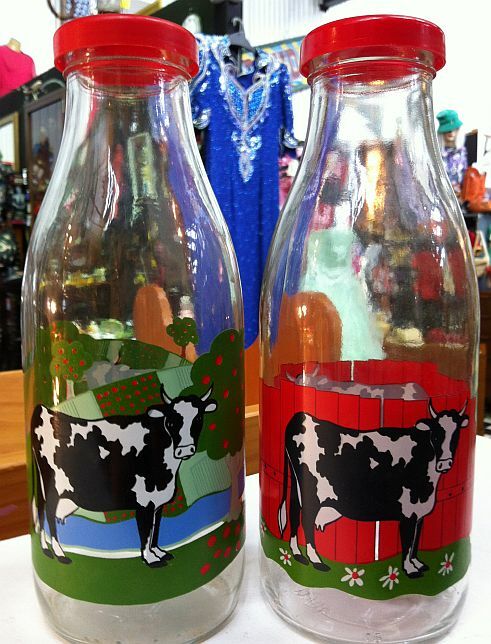 I must remember now to nab those milk bottles even seen them before in my thrifting jaunts. Although I never had a jewellery box like that I I remember friends having them and yes Holly Hobbie pieces a rather sort after these days. Holly Hobby!!!! I loved her so much, still wish I had my Holly Hobby bag......ahhhh the memories. Ok ok.....loving so many treasures., what great things......hmmmm I too spotted the beautiful sea-foam coloured chiffon gown in the background, stunning. Omg, I love that vintage jewelry box with the lovely ballerina. Awesome! YES! I adored mine. I used to play with my mum's, and one year an aunt bought me my own one. It was dark blue with stars outside and the inside lid had a mirror with some paper cut out trees so it looked like my ballerina was dancing in the woods at night. I loved it! 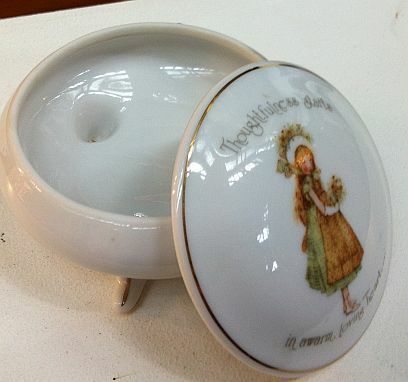 I had the ballerina jewellery box AND the Holly Hobby trinket box! SQUEEE! I think I still have my Holly Hobby pendant, actually...I also had the rag doll, not sure what else. The wee suitcase really wets my whistle! Awesome to have you back,babycakes!! Holly Hobby!!! I often see bits and pieces of Holly throughout my local op shops and they can be quite expensive. I wish I had kept all of my stuff from childhood. I have got one book and Mum gave it to me the other day - ahhh so cute!